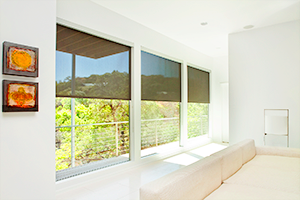 Modern roller shades provide solutions for sun control, glare, heat, fading, blackout and privacy. Available in hundreds of fabric colors and styles to compliment your decor, these systems are easily integrated into your home automation system and will create your ideal designed environment. Exterior retractable shading systems can provide comfortable, protected outdoor living areas at the touch of a button. 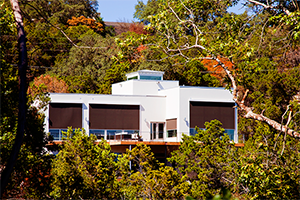 From insect control, sun and weather protection, to security and privacy – exterior systems are a versatile solution and can be easily automated for total home functionality. Texas Sun & Shade has provided interior and exterior sun control to the Austin area for 30+ years. Known for our superior products, sophisticated designs, motorization/automation expertise and exemplary service, we bring convenience, quality and comfort to your home or business. We’re proud to enhance living and lounging spaces around Austin with quality customizable awnings, shades, solar screens and more. Texas Sun & Shade has deep industry knowledge of retractable, motorized systems for both interior and exterior applications. Our team is comprised of talented consultants, licensed electricians and professional installers ensure reliable performance and function of our shade systems with dependable installations. Our hands-on experience will allow you to install motorized retractable systems with confidence. Showroom Hours: 10-5 M-F, 10-2 Sat.